Just a quick – and amusing – décor update for you all today, as Mr. P and I are in the middle of traveling all over the country and the world for weddings! This update is in our bathroom, which has a lot of towel racks – five, to be exact. In addition to one small countertop rack for a hand towel and the built-rack on the shower door, there are three mounted to the same long wall, practically in a row. Because I can’t find a way to take them down easily, I have to decorate around them. 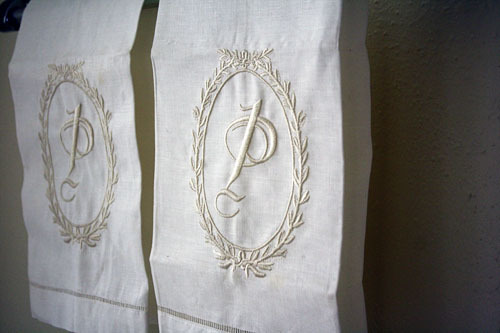 Sounds like an opportunity to use the monogrammed linen towels we got as a wedding gift, eh? 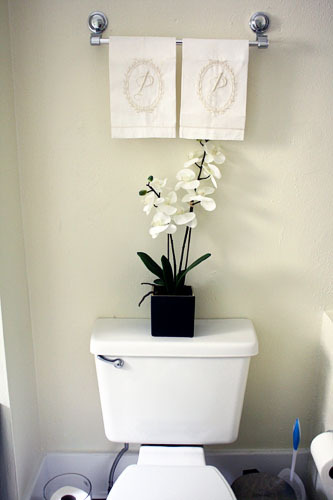 They’re quite nice, if not particularly functional, but goodness knows there’s plenty of space to hang the functional towels! So I’ve hung them on the middle of the three wall racks, to break up the wall-o’-racks with a little decorative touch. But there’s a small problem. Our last initial is P. There are two towels. And they’re hanging over the toilet. So if you come visit us, and you pay a visit to our facilities: Yes. Yes, I am aware that the towels over the toilet say “pee pee”. Does it make it any better if you know it’s a conscious design choice... and that I think it’s hilarious?